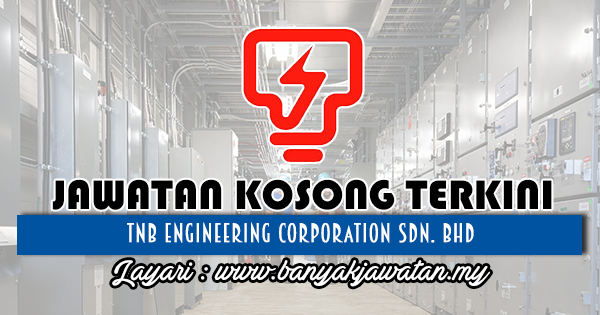 Jawatan Kosong 2018 di TNB Engineering Corporation Sdn. Bhd | Permohonan adalah dipelawa daripada Warganegara Malaysia yang berkelayakan dan berumur tidak kurang dari 18 tahun pada tarikh tutup iklan ditawarkan untuk memohon jawatan kosong di TNB Engineering Corporation Sdn. Bhd. TNEC is a wholly-owned subsidiary of Tenaga Nasional Berhad (TNB), which is the largest electricity utility in Malaysia and a leading utility company in Asia. Established in October 1993, TNEC has grown from being an energy related contractor to providing services such as designing, constructing, financing the District Cooling System (DCS) project implementation, ownership and undertaking long term operation & maintenance services in the area of DCS. TNEC is supported by the wide experience and knowledge of the TNB group of companies and the strong bond that TNEC shares with TNB. This has made TNEC the preferred partner for energy-related projects in Malaysia. This very relationship has been the driving force behind the company’s surge forward in securing projects and fulfilling customer demands. 0 Response to "Jawatan Kosong di TNB Engineering Corporation Sdn. Bhd - 27 Jun 2018"